Hello! Autumn with you today to share a funky masculine make featuring our amazing new Acoustic Guitar die. I was so happy to find some grungy, tattoo inspired paper in my stash and built a relatively flat design, all pointing to the amazing guitar die. I stamped part of the sentiment onto our Nesting Stitched Square die. The remaining part of the sentiment, "it is the secret of youth" is stamped inside. I fussy cut the flowers and scroll corner from my layers, then mounted things in order. I stamped the arrow sentiment to balance the design. The guitar die was cut from metallic bronze CS, with most of the design elements adhered inside. The metallic CS works with this glossy paper. I hope you like it! WOW! What a fabulous creation Autumn! And your papers are perfect ... I can hear the sounds of Mexico being strummed on the guitar and a Spanish dancer prancing around with her castanets! Well done! Excellent visual Darlene! How fun! Love how you pointed to that FAB guitar, it make for a great focal point! Awesome layering too. Great masculine card! 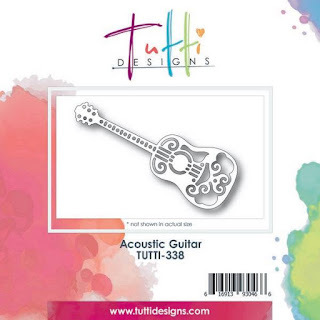 Perfect papers to use with this fabulous guitar die cut! Love how you've put the pieces back in. Great design! Wow - truly a WONDERFUL card Autumn. Bright, bold and beautiful. Makes me want to go get my guitar and strum a bit!! Xj.